SFP and ALDO A-List Event: You're Invited! Who doesn't love parties? And parties that involve shoes and accessories? Even better. 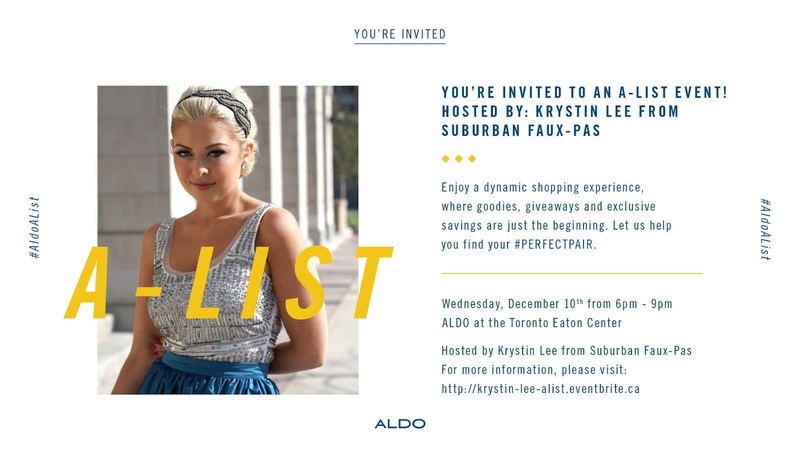 Come join me and ALDO at the upcoming A-List event at the Toronto Eaton Center from 6-9 on Wednesday, December 10. If you've never been to an A-List party from ALDO, you're definitely missing out. With beats, treats, swag bags, a shopping discount, prizes and more - it's always a fab time. And if we've never met - why not swing by and say hi! I'll be hanging out and sharing my personal picks from the ah-mazing holiday collection that just hit stores. I mean, can we just talk about the pumps in today's post?! The sleek look, two-tone material and comfortable heel definitely made it to one of my top picks list! Hope you can make it for some girl talk and shopping time- a killer combo :) And just wait till you see the shoes I've got picked out! See you there! Those heels, girl! Wowza! Such a fun pair to have! You look so cozy! Love those heels. Your little clutch is so cute! I love this coat. What a great classic colour and shape! Also, the natural colour palette you chose is perfection. I love that clutch! It's very eye catching. Fantastic coat and clutch! You look so beautiful and chic! Wish I lived in town! The party sounds so fun! I LOVE this look! You have such incredible style! You look amazing! That turtleneck looks so comfy and warm! These guys have a list of their preferred caterers for events in NYC, which you select. Food is amazing from hors' dourves to dinner. Servers cater to guests in an efficient manner.